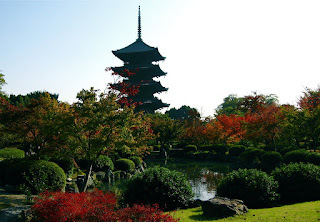 One Dumb Travel Bum: KYOTO!!! I walked into the Kyoto K's House Hostel, and was shocked to see it quite busy with foreigners. I hadn't see so many gaijin in one place since I'd gotten to Japan. "Wow! You guys seem pretty busy. How many people are here?" I figured there must be at least 10 or 15 people bunking up, which to me was such a refreshing change. She repied, "Oh its pretty quiet. We only have about 60 Westerners." I laughed so loud I almost fell over, much to her confusion. "ABC" is a fun inside joke amongst veteran backpackers, almost all of which have been through Europe. You are staring up at your 1000th altar or stain-glassd window, feet hurting, maybe a little hungover, debating whether its really worth taking another picture, and that's when it sets in. Another Bloody Church. Another Bloody Castle. You say "F-U" to that must-see renaissance painting in your guidebook and head happily, relievedly, out of the damp dark to a sunny beach for a cocktail. With this in mind, I was a little leery of wading into Kyoto, which by itself has literally thousands (!) of temples and shrines. So I went through my guide-book and pieced together a little Top 5 of ones that I figured were "must sees," and promised myself I would just give the rest a miss. After all, there is so much else to do in Kyoto, like Tea Ceremonies, Geisha Hunts, Katana slashing, and Kimono wearing!! (C'mon I'm doing it for the folks at home, you know I don't get any pleasure dressing up in women's clothes... or do I?) Not to mention a thriving nightlife, which for a change might actually have some people speaking English! I actually quite enjoyed many of the temples and shrines. There are three that really stand out: Kiyomizu-Dera, Kinkaku-ji, and Fushimi Inari. 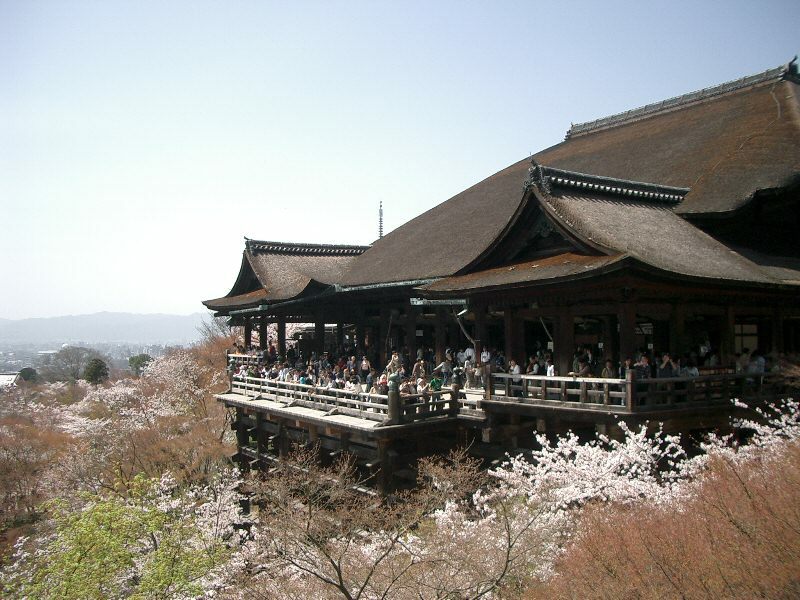 Kiyomizu incorporates that wonderful Japanese concept of integrating architecture into the natural surroundings. Kyoto sits in a broad valley surrounded by lush green hills on three sides. The most famous temples and shrines sit on the flanks of these hills, a world apart from the big city hustle and bustle. The main temple juts out over a large grove of cherry trees, with views of Kyoto. I cursed the cold weather, in only a week or two the view would be spectacular! After passing through the main temple, I came across the love stones. If I could traverse the 20 feet between them with my eyes closed, my wish for love would be granted. But seeing the queue of lonely Japanese lined up, I decided being single was perfect for a backpacker and headed for the sacred waterfall below. The waterfall houses an important Buddhist figurine, but none of the Japanese cared a whit about it. They were all lined up for a turn at drinking the water itself, which was said to have the power to grant wishes, restore health, bestow wisdom, and guarantee long life. After waiting in line for a bit, it was my turn. I didn't want to be greedy in front of the spirits and drank from only one of the three streams. Thoughts of bacteria quickly vanished when the surprisingly clean and sweet water filled my mouth. I drank deeply and thought about my wish. My life was pretty good and Aristotle's vision of the virtuous path was still in my head. I wished for the health and recovery of someone close to me. The next day I found myself at perhaps the most famous temple in Kyoto, Kinkaku-ji, the Golden Pavilion. The entrance is the usual tourist trap of hucksters hawking trinkets from huts, but after a quick stroll you find yourself staring at the Golden One. It was afternoon, and the light from the sun shone on the gold-flaked paint. The Japanese garden-pond reflected the temple perfectly, framed by little trees planted just-so. It was truly a postcard moment. There have been times where I've sat in awe before a world-famous building, like the Taj Mahal. The postcards never do it justice. And there have been other times where I've sat and scratched my head at the idiot who put it in a guidebook. With Kinkaku-ji, I'd say it felt like the postcard almost did it justice. It didn't feel a whole lot bigger than a picture, but it was certainly worth a look with my own eyes. Cameras never really capture colors the way your naked eyes see them. The gold was brilliant, balanced by the soothing green trees and tranquil pond. Some white and orange koi swam below me lazily. It was a nice spot. Nothing else in the site really compares to the Golden Boy, and so it was off to Fushimi Inari. I had seen plenty of pictures of the orange torii paths of Fushimi Inari, and so I figured a 10-minute stroll through the grounds would get the job done. Little did I realize that the temple was actually sprawled on a good-sized mountain, with the paths winding like long fingers up and down for miles. The most famous path is near the entrance, the one where the light barely shines through and all you see is orange. But I was determined to tramp through it all, to get away from the mob of tourists and get lost on the mountain. So, with ibuprofen in belly, up and away I went. And up. And up some more. Panting and sweating, finally I reached a viewpoint over the city, only to realize that this was the start of the real circuit. I saw a sign that indicated something important was at the top, so I up and down and down I went. When I realized I had been going down for too long, I asked someone else and they confirmed that, once again, I was Lost. I had taken a wrong turn and was headed back to Kyoto. This merited at least two forehead slaps. I climbed and climbed back to the start of the circuit, and took one of the two correct paths. Finally, up more endless stairs, and after exploring about 3 or 4 side paths, stumbling off the circuit, wandering through a wooded cemetery, and seeing so much orange my retinas were burned, the trees started to thin. I was near the summit. This was going to be something good, I could feel it. At the very top, I spied a large shrine. I climbed up the stairs to the main altar. And peered in to see..... a hole. I slapped my forehead again. Was this a joke? Perhaps the figurine was off to the cleaners. Perhaps it was a trick to get the viewer to think about the Buddhist concept of nothingness. Contemplating these things and my general stupidity, I set back off down the mountain. When I came to another shrine, I looked more carefully. What I had thought was a hole was instead the space below an altar bench. And above it was.... a large rock. Suddenly it hit me! This wasn't a Buddhist temple, it was Shinto. There were no figurines or idols. The object of worship was the rock itself! I studied the rock, it had a rope encircling its top. The Kami worshipped in this place was Inari, the spirit of the rice harvest. Inari's foxy messengers flanked the rock on both sides. On the bench below laid a few burnt used sticks of incense and some old dried flowers. I looked around at this huge mountain of 1000's of little shrines like this one, all honoring rocks, trees, little waterfalls. It struck me how this culture had such esteem for the natural world, how everything was sacred. For those who were bored enough to read my posts on philosophy, you will know that looking to nature for wisdom is my favorite theme. Its what binds all of humanity together, its our beginning, and without it we will surely end. And yet, these were the same people that hunted whales and dolphin for their meat, and are the largest player in driving bluefin tuna to the brink of extinction. Japan is a complex place, and perhaps I still have much more to learn.